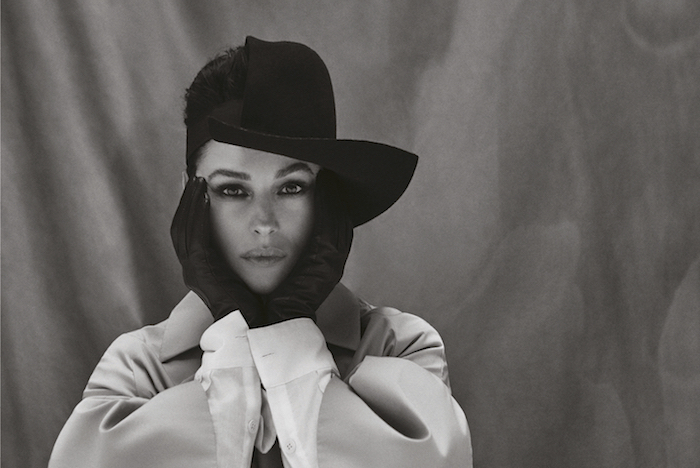 Glass was delighted to talk to Italian actress and model Monica Bellucci in Paris to discover more about her life and work. Having begun her modelling career at 13, Bellucci’s first major film was the BAFTA-winning 1996 romantic thriller L’Appartement, which also starred Vincent Cassel – the man she went on to marry. Having split with him nearly five years ago, Bellucci has been balancing work on high-profile projects – she starred as the oldest ever “Bond girl” at the age of 51 in Sam Mendes’s Spectre – with raising her impressively multilingual daughters Deva (13) and Léonie (seven). Along the way, she’s been unafraid to tackle unusual and challenging projects, the most controversial being Gaspar Noé’s 2002 psychological drama Irréversible, in which her character is raped in a notoriously protracted scene. Fluent in at least three languages, Bellucci learnt Serbian for Emir Kusturica’s 2016 drama On the Milky Road, which was four years in the making. High-profile American films include the Matrix sequels, Shoot ’Em Up and Mel Gibson’s The Passion of the Christ; Bellucci is also increasingly active in TV projects such as the 2017 series of Twin Peaks and the latest series of French sitcom Dix pour Cent, in which she plays herself. She’ll next be seen in Israeli director Eran Riklis’s upcoming spy thriller Spider in the Web, in which Sir Ben Kingsley will be co-starring. What’s it like working with Emir Kusturica? How is he different from other directors? He’s interesting because he does so many things … he’s a director, a writer, an actor, a musician. In his way of working, he’s a bit like Fellini. It’s another way of making movies – everything is about the light. The sun has to be right … everything can change, so the script is more like a base. But it was very interesting to be in this movie because it was a special atmosphere; this land I was in was beautiful but also very sad. I think Kusturica makes movies where there is duality between fantasy and pain, fantasy and reality. This is one of the most interesting parts of his world, and that’s why I approached this project from its human and artistic point of view, never a political one. The film is interesting because it’s a love story between two adults, and it proves that love and sexuality are a matter of energy and not age: we see two people that aren’t young any more but the moment they meet, something beautiful and magical happens. I got acquainted with [Kusturica’s] work through Time of the Gypsies. I saw it a long, long time ago – it was a really amazing work. In every movie he does, even when the stories are different, he comes back to his subject of fantasy and reality: it’s as if he’s in some way trying to escape the pain of his country through the dream. In his films there is violence, but at the same time there are moments of ecstasy. My favourite of your films is Alice Rohrwacher’s Le Meraviglie. What were the positives and negatives of acting on such a small-scale, parochial film? No negativity at all. And I’m happy there are good Italian directors like Alice Rohrwacher, [Matteo] Garrone, [Paolo] Sorrentino, [Luca] Guadagnino – it’s amazing to see the possibility to come out of [Italy] and make an international career. Because we were very stuck with Fellini, Rossellini, Visconti, De Sica, which was great, but it’s beautiful to see this new generation of young, talented directors coming out. The talent of directors and actors is there, it’s just that sometimes there are political and economic problems. I like Alice very much – she’s very natural, very direct, very human and very private. I like that very much. You’ve just starred in the French TV series Dix pour cent, and you played an opera singer in the US TV series Mozart in the Jungle. How do French and Italian TV compare to US TV, other than presumably having less money? In Italy, there have been very good TV series, like Gomorra. Even in France, they do very good TV series. Dix pour cent is on Netflix and is very successful. Netflix gives a chance – even French and Italian series can go all over, and it’s a new way to communicate. [Jean-Luc] Godard used to say that when you look at TV you look down, and when you look at cinema you look up. But I think today everything is changing, and when you can see what we can do in TV series, what kind of roles actresses can have – like in Big Little Lies – it’s amazing to see all these actresses have amazing roles like that, and explore so many [facets of] the human condition. So many people don’t go to the cinema. Cinema is in the home now, and that’s a great way to communicate with people who don’t often go to the cinema. But cinema too is communication. TV, cinema – if it’s good quality, why not [both]? Have you any ambition to do theatre work? No, actually … But I’m sure one day I’m going to find something that gives me the feeling that I want to repeat it every night. It’s a special thing, theatre – [stage] actors tell me that all the time. When you’re onstage, every night is different because every night you have the new possibility to express the pièce. I’m sure that one day I am going to have this experience. But for now, yes, just movies. What is beautiful about acting is that for some actors it never ends. You can have [acting] experiences even when you’re 70. Even in France, actresses are “Mademoiselle” all their life – never “Madame”, always “Mademoiselle”. It’s a never-ending story in some way. You’ve said before that you “come from the world of fashion”. Fashion, like acting, demands a degree of physical mastery – but does it have any emotional dimensions? Fashion gave me the possibility to get in touch with myself. Because actually, as I say all the time, the body is so important to express yourself. When you’re an actor, it’s like being a dancer in some way – everything gets through the body … you are your own instrument. So the fashion world was interesting for me to get in touch with these feelings, and also, for me, it was a question of passion. When I was young, I was in love with pictures and I used to think that a beautiful picture can give you great emotions, like when you watch a great movie or read a great book. Through that I learnt that to be an actor is such special work, but also very fragile. You are your own instrument, so everything can be very delicate: fragile but beautiful. Sometimes when you see incredible dancing – for example, I went to the Bolshoi and it was one of the most beautiful things I’ve seen in my life – you see how our bodies can make magical things. This is what happens to an actor, when they give their body for the role. The body becomes an object of work. But you have to respect your body. Even when you give your soul for a role, you have to always respect your soul. For me, it makes the work more interesting. [Physicality gives me] the possibility to get in touch with different people, different cultures. Like I said before, it is about communication, [whether I] work with Alice Rohrwacher or Sam Mendes or make an American TV series or a French TV series. You’ve worked in film industries around the world. Obviously, the Harvey Weinstein scandal was huge last year; where is that kind of predatory sexual behaviour worst? Is Hollywood particularly bad? I come from fashion, where of course young girls can get into those kinds of situation. So when I got into cinema I was already old enough to see how to deal with those situations. It’s true that when you’re young, you [are] in touch with people who are powerful and can use their power to make you feel humiliated. This can happen. But I don’t know if that’s sexuality or just [pure] humiliation. Sometimes people are like two personalities – one is very intelligent and talented, [and the other is] completely sick. It can be in any industry, any situation. It’s very difficult. It’s beautiful that women today can talk about it. They’re less scared. Sometimes women are like birds – they get stuck in a cage and don’t go out, because they’re scared. To come out of this kind of feeling takes time. Is it the same all over the world? Yes, of course. In every situation – it can be cinema, it can be fashion, it can be in an everyday office. It’s what happens when you give power to people, and it’s about personalities. You can use your power in a good way or a bad way. It’s just about dealing with power. Those people use their power to cover their own sickness. What’s the most difficult film you’ve ever been involved in? Irréversible … it was difficult but very enriching. And to work with Gaspar Noé was so interesting because he’s such a talented director. It caused quite a scandal when it was released in 2002. Yes, a scandal, but today it’s a cult movie. They study this movie in schools of cinema. The way it was made is so special. Did it change the kind of role that you were being offered? It’s more what kind of roles I [started] looking for. As an actor, the opportunities [are beyond your control], but at the same time your freedom lies in your choice. If you [choose a certain role] it’s because maybe you’re looking for something or there is a part of you – a darkness, maybe – that needs to come out. Do you have a favourite of your own films? I don’t know; it’s so difficult to say. Maybe L’Appartement, [which] gave me so much. It was my first French movie, it won a BAFTA, and through that film I had the chance to make my first American film, with Morgan Freeman and Gene Hackman, called Under Suspicion. And through [Under Suspicion] I could go to Cannes for the first time. It’s incredible how life is strange, and how a mix of coincidences brings you someplace that isn’t [down to] you. Too many. [Laughs] When I say that, I realise how happy I am – I still have a lot of passion for my work, and I still have so much to learn. This makes me feel excited and happy – I feel I want to be in this business. And I’m so happy I can lead my life through my work. You’ve defended airbrushing or “retouching” in the past. Don’t you think it contributes to unrealistic images of women? Of course, when there’s too much it’s not beautiful any more. But things are changing right now … they all understand when retouching is too much. It’s like sometimes when you see publicity from 15 years ago, you see how now it’s completely different. The picture looks so old when it’s too retouched. Everybody understands that too much retouching takes the life out of the picture. You can’t recognise the faces any more. You’ve said in the past, “Pour moi, tout est politique.” What do you mean by this? It’s about choices. When you choose to have children, it’s because you’re positive about life. You believe that things can change, that even though things are terrible sometimes you have faith in humanity. It’s a beautiful choice that you make as a woman. Well – beautiful or not, it’s a choice of faith. What do you make of Emmanuel Macron? People like him very much. I don’t vote in France, but I like him. I think he’s bringing something new, a new energy, and so young. Do you vote in Italy? I vote in Italy … I have different bases – Rome, France, Portugal – but this is the way I’ve always lived. It’s even the way I’ve approached my work – different countries, different directors … if I wanted to make an international career, that’s the only way I [could]. But it’s so interesting for me. When I’m with Emir Kusturica, I speak Serbian, when I’m with Bahman Ghobadi I speak Farsi – but of course I don’t speak those languages in real life. It’s just for the movies. But [languages are] so interesting. What do you make of Italian politics right now? Those in power are somewhat older than Macron – Prime Minister Paolo Gentiloni, President Sergio Mattarella. Where do you feel you stand politically? Things right now in Italy are going better. Economically the situation is better right now. We call Italy “il bel paese”, and maybe there is a reason for that. And I have to say, when I go around the world, I smile when I say I’m Italian … even though there are so many problems in our country, the attitude of Italian people is beautiful. The theme of this issue of Glass is Timeless. What’s the most timeless film you’ve starred in? [Thinks for a while] Hmm … Malèna, by Giuseppe Tornatore. It’s about a woman during the Second World War. What was it, 2000? 18 years old already. It doesn’t get old. The film is still very beautiful. In your opinion, what makes something timeless? It’s difficult to say. Maybe a subject that is the basis of humanity … something that is not about fashion, or the [zeitgeist]. When you see something that is timeless, it touches the soul. Consider the Pyramids. They’re timeless, like a film, a book or a painting. They touch your soul.